A high solids, low viscosity, hard wearing, heavy duty alkyd formulation floor paint for use internally on concrete, wood, brick and stone. 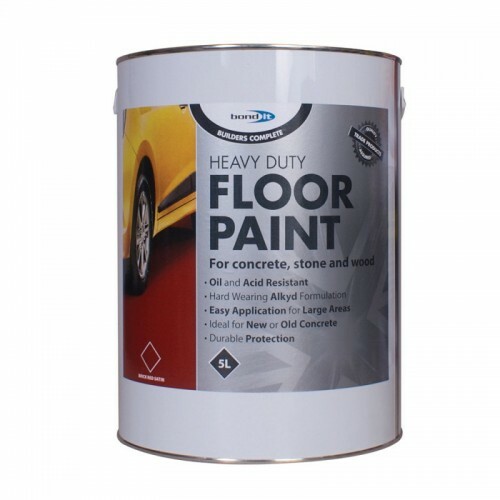 Designed to give a hard wearing, easy clean finish to concrete, stone, brick and wooden floors subject to light to medium traffic including fork lift trucks and scissor lifts, etc.Suitable for use on garage floors, warehouses, workshops, factories, storerooms, pedestrian walkways and is designed to give enhanced durability, abrasion resistance and good resistance to dilute acids/alkalis and oils, including brake fluid, engine cleaners, screen wash, anti-freeze, power steering fluid, diesel and sump oil. Dries to a satin finish. Concrete must be a minimum of 6 months old before paint can be applied. Priming isn't usually required, but if necessary apply a coat of 1 part white spirit to 4 parts paint and allow to dry. Bond It Floor Paint is touch dry within 2-3 hours depending on ambient temperatures. Please note that low temperatures can significantly affect drying time. This product is ready to use product and does not require diluting. Apply using brush or roller to give even coat. 2 coats are usually required, requiring 16-24 hours between each coat. Will dry to a satin finish. Clean tools and brushes with white spirit. Cured paint can be removed using xylene. For internal use only.